Minister Ze’ev Elkin responds to secret letter between Herzog and Abbas in which opposition leader agreed to divide Jerusalem. Minister of Jerusalem Affairs Ze’ev Elkin on Sunday night responded to the secret letter of understanding signed between Zionist Union leader Yitzhak Herzog and Palestinian Authority (PA) chairman Mahmoud Abbas, in which Herzog agreed to a number of long-standing Arab demands. Among the subjects covered in the letter are the division of Jerusalem, the future disposition of Judea and Samaria, and the so-called “right of return” for Arabs who left the country in 1948. According to the agreement, Herzog conceded all of Judea and Samaria and accepted the partition of Jerusalem, surrendering portions of the capital to a new Palestinian state. Contents of the letter were exposed Sunday by Channel 10 News. 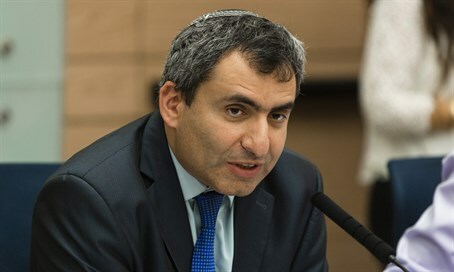 “The exposing of the secret agreement between Herzog and Abu Mazen proves once again that the Likud’s victory in the last elections saved the State of Israel's from a plan involving the most dangerous concessions, including the division of Jerusalem,” said Elkin. “We learned once again that today's Labor party is an extreme leftist party, and that a large gap separates us from them and they have no place in a government headed by the Likud,” he added. The document included a unique arrangement for Jerusalem, which would be the shared capital of both states and under split sovereignty, yet would be managed by a single municipality. Even the Old City itself would be divided under the framework agreed upon in the Herzog-Abbas letter, with the Western Wall kept under Israeli control, while the Temple Mount would be placed under international control. In exchange for Herzog’s concessions, Abbas accepted a “symbolic” Israeli presence in the strategically critical Jordan Valley region along Israel’s eastern border.